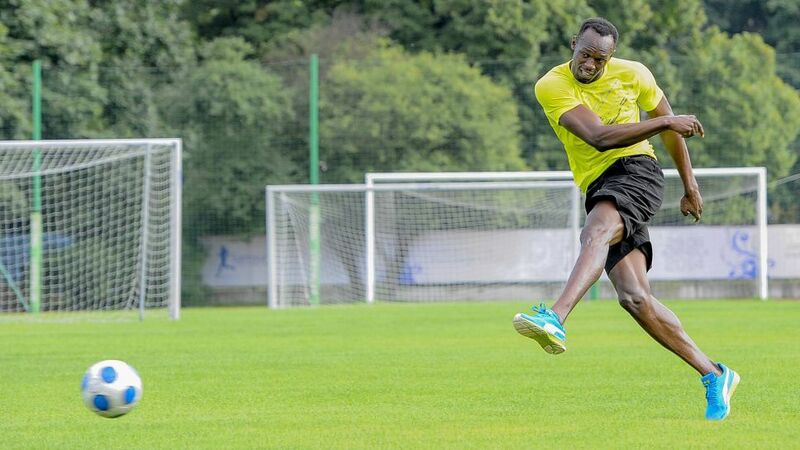 Already famed for their lightning-quick attacking style, Borussia Dortmund may be set for a lesson in how to hit the turbo boost with sprinter Usain Bolt set for a stint training with Die Schwarz-Gelben. Click here to bolster your Official Fantasy Bundesliga team with some of Dortmund's deadly attackers. In an interview with English daily The Guardian over the weekend, it was suggested that the reigning World and Olympic 100m and 200m champion had been in contact with Dortmund about the possibility of training with the North Rhine-Westphalia club. "It's neither a joke nor a marketing measure, it's something that has been decided on for quite a while," Dortmund chief executive Hans-Joachim Watzke told German sports magazine Kicker when asked about Bolt's intentions. Watzke added that he learned, "...a few weeks ago that Usain had asked if he could train with us; I said absolutely, no problem at all. Our coach (Thomas Tuchel) is also good with it." It is well-known that the Jamaican sprinter is a passionate football fan and, despite now being 30, still harbours serious ambitions of playing professionally. Although he would not be drawn on Bolt's desires to sign for a top club, Watzke said that BVB would be delighted to entertain the Kingston-native at their Dortmund-Brackel training base. Dortmund host FC Bayern München on Matchday 11 - head to the Match Centre for all the pre-game build-up!